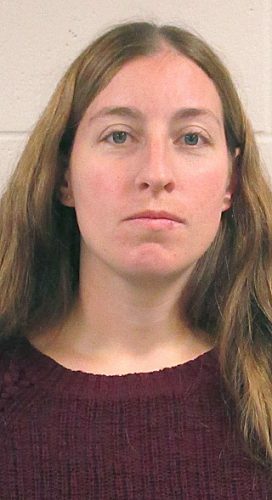 Myra Rosin, 33, 1509 N. Minnesota St., New Ulm, was charged Friday with felony fifth-degree drug possession-not small amount of marijuana and misdemeanor open bottle possession. According to a Statement of Probable Cause, New Ulm Police stopped a vehicle in which Rosin was a passenger on April 29. When Rosin stepped out of the vehicle to take a test, police noticed a glass pipe that appeared to have been used to smoke methamphetamine. Police also saw an open beer in the floor of the vehicle. Residue from the pipe tested positive for methamphetamine. Rosin was arrested for possession of methamphetamine. She was transported to the Brown County Jail and transferred later to detox. Timothy C. Coners, 20, 202 2nd Ave. West, Lamberton, was convicted Monday of felony third-degree criminal sexual conduct-victim 13-15, actor more than 24 months older. Four other third-degree criminal sexual conduct charges were dismissed. He was sentenced to 36 months in the St. Cloud Correctional Facility, stayed for five years supervised probation. He was fined $1,575, credit for up to $500 towards fine for out-of-pocket treatment expenses. He was sentenced to 30 days in the Brown County Jail. Conditions include completing and following recommendations of a psychological evaluation and chemical use assessment. He must have no contact with victims or females under age 18 unless approved by agent, install monitoring system on internet. He must register as a predatory offender. Michael A. Chenoweth, 35, Benson, was convicted Monday of gross misdemeanor driving after cancellation-inimical to public safety. He was fined $985, STS in lieu of fine, sentenced to 365 days in the Brown County Jail, 335 stayed for two years supervised probation.